Abandoned superhero bases are incredibly valuable and dangerous places. They can found anywhere, including the ocean floor. Finding them is only half of the battle though. Sometimes, a group of superpowered scavengers can crack open a base only to find that they’re the only ones who can save the world! Boiling Point is a new adventure for the Base Raiders role playing game. It mixes investigation, exploration, combat, and social conflicts for a perfect blend of excitement and fun. It can be used as a first time adventure for players new to the system, part of an ongoing campaign, or as a one shot. It contains new enemies, allies, superpowers, loot, and more. Listen to an actual play playtest of Boiling Point and its exciting conclusion. 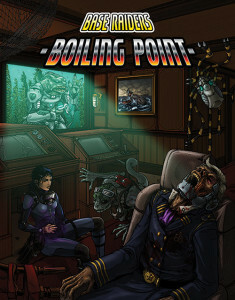 Boiling Point is available for purchase from DrivethruRPG or the Base Raiders store.